Wow. I can’t believe I was in Paris this time last week, and now this has happened. My thoughts are with those affected. It’s at times like these when I get homesick. But it’s not the usual homesick. I don’t long for my mountains or the poutine or the Ehs, I just want to hug my little brother and little sister really tight and not let go. If I’d taken my Paris trip just a week after I did, I could easily have been one of the victims. I could have been one of the witnesses who now have to live with what they’ve experienced. And I wonder how many people would know if I had been there? It’s far too easy to put myself in the places of the victims. It was a close call for me. I was lucky, I guess. 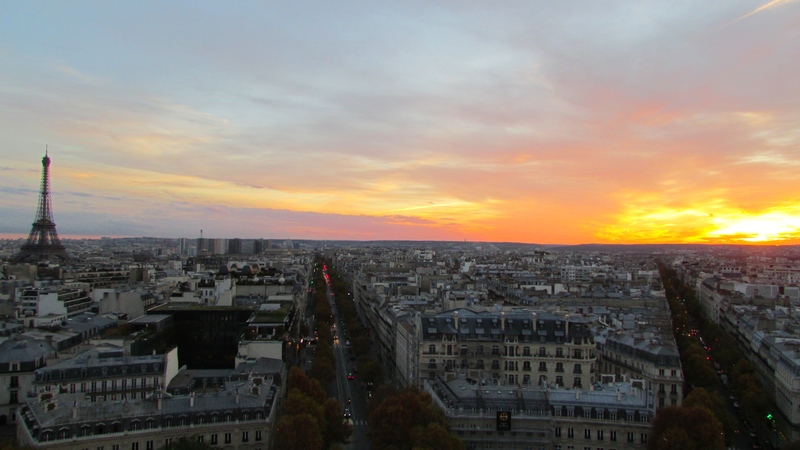 I took this photo a week ago today from L’Arc de Triomphe at sunset. L’Arc de Triomphe, for those of you who don’t know, stands over the resting place of the unknown soldier and is a monument to remember fallen soldiers from the Revolution and Napoleonic Wars. If I learned one thing in Paris, it was that the French, though they love to celebrate their victories, also remember their losses, always. We stand with you, Paris. The sun will rise again, but we will not forget.